The career of Congresswoman Katherine Gudger Langley illustrates a highly unusual route to Congress. Her husband, John Langley, resigned his House seat after being convicted of violating Prohibition laws. Katherine Langley then defeated her husband’s successor and won election to the House in a “vindication campaign” designed to exonerate her disgraced spouse. Katherine Gudger was born near Marshall, North Carolina, on February 14, 1888, to James Madison Gudger and Katherine Hawkins.1 Gudger graduated in 1901 from the Woman’s College in Richmond, Virginia, and went on briefly to Emerson College of Oratory in Boston. A short teaching job in speech in Tennessee ended when she left for Washington, D.C., in 1904 to become her father’s secretary when he was elected U.S. Representative from North Carolina on the Democratic ticket. That same year she met and later married John Langley, a former state legislator and attorney working for the Census Bureau. The couple settled in Pikeville, Kentucky, where John Langley successfully ran as a Republican for the House of Representatives in 1906. He eventually won re–election nine times in a safely Republican district that was an old unionist stronghold in eastern Kentucky. Katherine Langley claimed her husband’s seat in the House of Representatives under very unusual circumstances. “Pork Barrel John” Langley was convicted of “conspiracy to violate the Prohibition Act” by trying to sell 1,400 bottles of whiskey.3 He won re–election in 1924 while his conviction was being appealed. When the U.S. Supreme Court refused to overturn the decision, he resigned from the 69th Congress (1925–1927) on January 11, 1926, and was sentenced to the federal penitentiary in Atlanta for two years. “They believe he was the victim of a political conspiracy,” reported the Lexington Leader of the district’s reaction. The disaffection of Republicans in eastern Kentucky over the lack of effort by Senator Richard P. Ernst to defend John Langley contributed to Ernst’s re–election defeat in 1926 to Alben Barkley.4 Langley’s district manifested a persistent sense that Kentuckians were “drinking wet and voting dry.”5 On February 13, 1926, Republican Andrew J. Kirk succeeded Congressman Langley in a special election to fill out the remainder of his term in the 69th Congress. John Langley’s conviction and resignation in disgrace left his wife socially ostracized in the conservative Washington social scene. Capital elite did not approve when Langley extended her family’s practice of patronage within the congressional office by hiring her married daughter as her secretary.11 Observers were quick to notice that the former speech teacher followed a more archaic rhetorical style than was favored at the time. “She came from the ‘heart of the hills,’” writes Hope Chamberlin. “Coal, ‘king of energy,’ was dug by ‘stalwart and sturdy miners.’” Sometimes given to verse, she described the Kentucky mountaineer as “‘a man whose grip is a little tighter, whose smile is a little brighter, whose faith is a little whiter.’”12 Her reputation grew when she interrupted a debate on tax legislation to praise a Kentucky basketball team.13 Her committee assignments were not impressive. She was appointed to the Committee on Claims, the Committee on Immigration and Naturalization, and the Committee on Invalid Pensions. 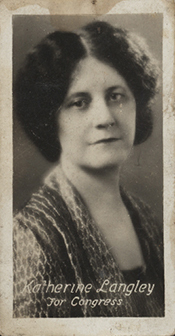 In the 71st Congress (1929–1931) she also served on the Committee on Education. In early 1930 Langley achieved an important first. She became the first woman Member to serve on the Republican Committee on Committees, succeeding John M. Robsion when he was appointed as U.S. Senator.14 As a member of the Committee on Committees, Langley served on the body that assigned Republican Members to the standing committees. The Republican conference specified that each state delegation with a party member would have a seat on the committee. The state’s representative on the committee would have a vote equivalent to the size of the state’s Republican delegation. Furthermore, each state party caucus would select its committee representative.15 Langley’s achievement is cast in a different light as a result. She was the most senior member of the Kentucky Republican caucus after Robsion left, and her appointment came after the committee assignments were made for the 71st Congress. To take full advantage of this position of influence, she would need to win re–election. 1Francesco L. Nepa, “Langley, Katherine Gudger,” American National Biography (ANB) 13 (New York: Oxford University Press, 1999): 156–157. There is the possibility that the 1888 birth date may have been in error. Langley may actually have been born in 1883. 2Nepa, “Langley, Katherine Gudger,” ANB. 3James C. Klotter, Kentucky: Portrait in Paradox, 1900–1950 (Frankfort: Kentucky Historical Society, 1996): 283. 4Hope Chamberlin, A Minority of Members: Women in the U.S. Congress (New York: Praeger, 1963): 64; Klotter, Kentucky: 283. 5John Ed Pearce, Divide and Dissent: Kentucky Politics, 1930–1963 (Louisville: University Press of Kentucky, 1987): 11. 6Chamberlin, A Minority of Members: 64. 8Nepa, “Langley, Katherine Gudger,” ANB; “Election Statistics, 1920 to Present,” http://clerk.house.gov/member_info/electionInfo/index.aspx. 9“Mrs. Langley to Retire From Politics in 1930,” 25 December 1928, Washington Post 5. 11Chamberlin, A Minority of Members: 65; Susan Tolchin, Women in Congress (Washington, D.C.: Government Printing Office, 1976): 46. 12Chamberlin, A Minority of Members: 64–65; “‘Lady from Kentucky’ Wins Her First Plea,” 25 January 1928, Washington Post: 4. 13Chamberlin, A Minority of Members: 65. 14“Woman on Committee on Committees,” 19 January 1930, New York Times: 25. 15William L. Morrow, Congressional Committees (New York: Scribners, 1969): 45. 16Chamberlin, A Minority of Members: 65. In a Christmas message that year sent to her constituents, John Langley announced that his wife would not be a candidate for re–election in 1930. Whether or not John Langley would take advantage of the pardon to run for his old seat and resume his political career was left ambiguous. A newspaper photo caption suggested that the issue would “be a matter for the family council.” See, “Mrs. Langley to Retire From Politics in 1930,” 25 December 1928, Washington Post: 5; and “Langley May Return to Politics,” 2 January 1929, Washington Post: 4. 17Chamberlin, A Minority of Members: 65. Toward the end of 1929, John Langley finished a manuscript entitled “They Tried to Crucify Me, or the Smoke Screen of the Cumberland,” dedicated to his deceased parents and to his wife. The book sought to prove that his conviction was an attempt by the scandal–ridden Attorney General Harry M. Daugherty to distract the public from the growing scandals of the Harding administration. See, “Langley Issues Book on His ‘Persecution,’” 9 December 1929, New York Times: 32. 18“Gentlewomen of the Congress Find the House More Stimulating Than the Home; Try for Reelection,” 2 March 1930, Washington Post: S3. 19“Kentucky Election Surprise Forecast,” 4 August 1930, Washington Post: 5; “Former Kentucky Governor Defeated,” 5 August 1930, Washington Post: 1; “Kentucky Renames Congress Members,” 5 August 1930, New York Times: 4. 20“Republican Upset in House Foreseen,” 15 October 1930, New York Times: 5; “Kentucky Campaign Marked by Apathy,” 26 October 1930, New York Times: 17. 21“Election Statistics, 1920 to Present,” http://clerk.house.gov/member_info/electionInfo/index.aspx “Nip and Tuck for the House,” 6 November 1930, New York Times: 17. 22“Laffoon Has Best Chance in Kentucky,” 13 September 1931, New York Times: E8. 23“John W. Langley Dies in Kentucky,” 18 January 1932, Washington Post: 1. 24“Mrs. J.W. Langley, Once in Congress,” 16 August 1948, New York Times: 19; “Mrs. Langley, Ex–Member of Congress, Dies,” 16 August 1948, Washington Post: B2. "Katherine Gudger Langley" in Women in Congress, 1917-2006. Prepared under the direction of the Committee on House Administration by the Office of History & Preservation, U.S. House of Representatives. Washington: Government Printing Office, 2006.